If you need a little magic in your life, head for Bass Hall in March to see the touring Broadway show, Finding Neverland. Performing Arts Fort Worth presents the national tour at Bass Performance Hall March 20-25. Tickets are $44-$115 and are available to order online at www.basshall.com. Based on the Academy Award-winning motion picture by David Magee, and the play “The Man Who Was Peter Pan,” by Allan Knee, Finding Neverland follows the relationship between playwright J.M. Barrie and the family that inspired Peter Pan (aka The Boy Who Wouldn’t Grow Up) for one of the most beloved stories of all time. Directed by Tony®-winner Diane Paulus, with a book by Olivier Award®-nominee James Graham, music and lyrics by Gary Barlow and Grammy Award®- winner Eliot Kennedy, and choreography by Emmy Award®- winner Mia Michaels, this new musical is packed with mesmerizing visuals, irresistible songs and plenty of laughs. 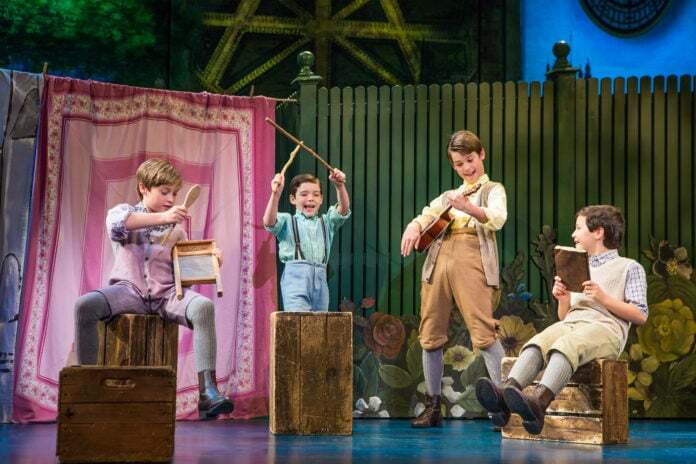 Finding Neverland is a timeless story about the power of imagination… and spectacular proof that you never really have to grow up. The cast includes stage and screen star John Davidson as Captain Hook/Charles Frohman); Broadway veteran Karen Murphy as Mrs. DuMaurier; Lael Van Keuren as Sylvia Llewelyn Davies; Will Ray as J.M. Barrie; and Turner Birthisel, Connor Jameson Casey and Bergman Freedman in the rotating roles of children Peter, Jack and George. The cast also includes Brooks Hamilton, Tyler Patrick Hennessy, Colin Wheeler, Sarah Marie Charles, Ixchel Cuellar, Dwelvan David, Matthew Davies, Janine DiVita, Nathan Duszny, Anthony Festa, Ellie Fishman, Mary Kate Hartung, Victoria Huston-Elem, Nathan Keen, Thomas Miller, Noah Plomgren, Dee Tomasetta, Karl Skyler Urban, Matthew Quinn, Jayme Wappel and Matt Wolpe. The production features scenic design by Tony Award®-winner Scott Pask, lighting design by Tony Award®-winner Kenneth Posner, costume design by Suttirat Larlarb, sound design by Tony Award®-nominee Jonathan Deans, hair and make-up design by Richard Mawbey, projection design by Jon Driscoll, music supervision by Fred Lassen, musical direction by Ryan Cantwell and casting by Stewart/Whitley. “Finding Neverland” is produced by NETworks Presentations. The show is presented by Performing Arts Fort Worth, as part of the 2018 Broadway at the Bass series. This year’s Broadway at the Bass series also includes Waitress (June 19- 24), Love Never Dies (August 7-12) and School of Rock (August 28-September 2), all making their Fort Worth debuts. To charge tickets by phone, call 817-212-4280 in Fort Worth; 1-877-212-4280 (toll free) outside Fort Worth; or order online at www.basshall.com. Tickets are also available at the Bass Performance Hall ticket office at 525 Commerce Street.